As a follow up to the first Francophone Seminar held in The Hague (Netherlands) in June 2009, the Hague Conference, in partnership with the Governments of France, Belgium, Canada, Italy, the Netherlands and Switzerland organised a four-day workshop on the implementation and operation of the Hague Convention of 29 May 1993 on Protection of Children and Co-operation in Respect of Intercountry Adoption ("the Convention") in certain francophone countries of origin in Africa and the Caribbean. 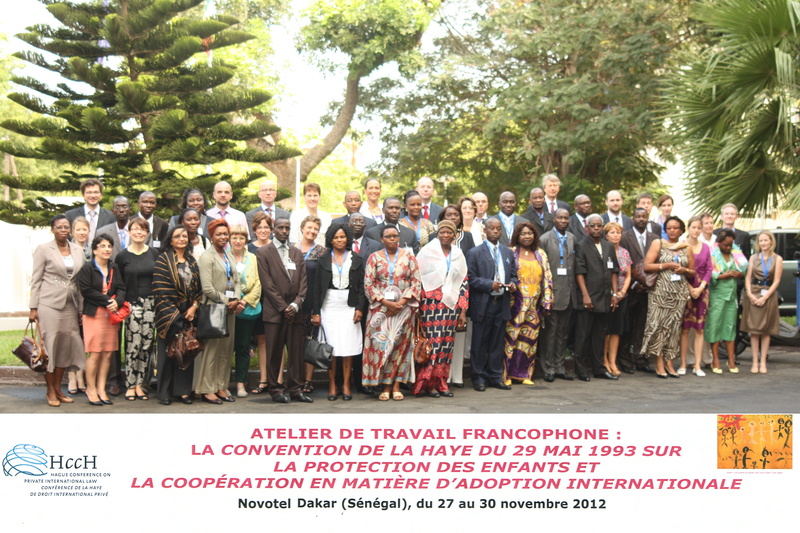 The workshop took place in Dakar (Senegal) from 27 to 30 November 2012 and gathered more than 60 experts from Central Authorities, the judiciary and international organisations. The aim of the workshop was to bring together experts and judges from different French-speaking countries in order to increase knowledge about the Convention and promote its practical implementation in these countries. The work programme included the sharing of experiences and good practices in a wide range of fields related to intercountry adoption. The workshop also encouraged other countries to sign and ratify or accede to the Convention in order to guarantee that intercountry adoptions take place in respect of the best interests of the child. The invited countries were countries of origin which are parties to the Convention (Burkina Faso, Burundi, Guinea, Mauritius, Madagascar, Mali, Rwanda, Senegal and Togo) and countries of origin which have shown an interest in becoming a party (Benin, Congo, Côte d'Ivoire, Niger, Haiti and Democratic Republic of Congo). Furthermore, French-speaking experts from Belgium, Canada, France, Italy, the Netherlands, Switzerland and the United States of America were invited, as well as experts from other international organisations (UNICEF) and non-governmental organisations (Euradopt, International Social Service, Save the Children and African Child Policy Forum (ACPF)). Since 2009, three new francophone African states have signed and ratified or acceded to the Convention (Senegal, Togo, and Rwanda), and a Caribbean state has signed the Convention and adopted a decree of ratification (Haiti). The Conclusions and Recommendations of the Workshop are available in English and French.